As I grew out of the ashes and was ready to spread my wings again, I decided to move back to my hometown to regroup and beat this injury without doctors ($5000 and 3 years of doctors later). As I was leaving and had my going away party at a local wine bar, my friend Shelly (who you can read the success story under "Custom Built for Each Other") brought her new boyfriend to the bar and I got to talking to him. I approached her and said, "Where did you meet this guy? He's the kind of person I could just hang out with all the time." She responded, "
So I moved to San Fran area 2 days later, and once back about a month, I put up an ad and wrote an honest account of my story, what I'd been through, and what type of person and companion I'd like to meet. I connected with about 2 people saying hi before SHE messaged me. Meredith had gone through a very tough 4 years of physical and hormonal problems following the loss of a friend to cancer. Her symptoms were that of course doctors couldn't help. They said she was hyper-thyroid, then Hypo, she was anemic, intense fatigue, excessive anxiety, and borderline diabetic. She eventually was led to a Kinesiologist in Sacramento who not only got her started on the road to health, but also introduced her to a health coach in the Alkaline cleansing field. Once embracing the need to alkalize her body, she began a 3 month intensive alkaline cleanse. She continued with a strict practice of alkalinity for a total of 9 months, and by that time had reversed all of her symptoms and lost nearly 50 pounds. She was reminded to keep going by finding white feathers along the way. White feathers everywhere. These were a rememberance of her friend that had passed. As she looked up online what the spiritual meaning of white feathers meant, she found out that they were a symbol of Ascension, and she started reading about ascension. One of the websites that came up was "
" and as she clicked on the page to see what was out there, she came across my photo and story. Only being able to read a portion of my profile without joining, she signed up for membership to read my profile, and was taken by what was said. Meredith then sent me an email sharing her story and full vulnerability of what she'd been through. I read it knowing that she and I could understand what strength those struggles had brought out in us, and about a week later, Meredith asked me to coffee because she was visiting a friend "in the area" (which was a little white lie...). Well, that date was 11/11/11, we shared a berry cobbler and had tea. 2 1/2 hrs later, we continued to chat over Shepard's Pie for dinner at our local pub down the road. And when I walked her back to the car, I leaned in to kiss her, and knew that something special was there. 2 years later on May 30, 2014, I proposed by writing a song I performed at one of my Jazz performances, and on Sat July 19, 2014, we were married. 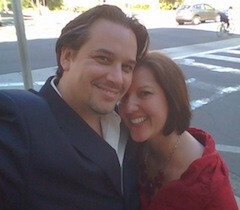 I am such a lucky man and everyday we thank the creator and the Conscious Dating Network for bringing us together. We are truly blessed and bountiful. NOTE: There are many sites in the Conscious Dating Network that all share the same large database of members, so you may meet someone from a different site than you joined, however, it's really one big site with different marketing doorways in!